Nostradamus Predictions, a Psychic Future look into John McCain's Shocking Presidential Campaign this October, just before the United States November Presidential Elections 2008. Cain is not Able, Artery cause is believed. Many will believe that they are Deceived. Nostradamus made a promise to the world nearly 5 centuries ago. To return in five Hundred years to share thousands of new predictions to protect us in the troubled times just ahead. For those not familiar with my pages, I am John Le Sainte. The True Soul and Spirit of Nostradamus first appeared to me on December 21, 2003, and revealed that I, John Le Sainte, am his sole heir to his gift of Prophecy. 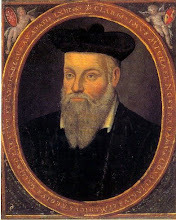 Each Night, Nostradamus Visits my Dreams and guides me into the future as he had done 5 centuries earlier. I now share these new predictions and prophecies of the future with you here. Nostradamus has shown me visions for nearly five years now. I am slowly publishing these visions as Nostradamus had 5 centuries ago as 4 line poems known as quatrains. Nostradamus and I create these new predictions to share with the troubled world of today. I am releasing some Prophecies earlier than expected to help prevent tragedies, including this event to befall America this October, just before the presidential elections. Unlike the original Nostradamus Predictions or Prophecies , I am explaining many of them fully so that there may be absolutely no doubt, or guess as to the events to come. John McCain will take ill about 9 days before the elections are to be held. He had been running behind in the polls and not expected to win. The timing of John McCain's sudden illness could not have been worse. The True Soul and Spirit of Nostradamus had shown me this vision about 16 months ago. After campaigning night and day right until the upcoming Presidential Elections, John McCain will begin to seem especially tired and confused. It is only described as "Campaign Fatigue" to the press, until he collapses at a gathering on live television. He is rushed to the hospital and no "Official" word of his condition is given for over 24 hours. Rumors "leaked" to the press by McCain staffers, were that he had had a mild stroke and was recovering nicely. However, this will not be the case at all. The Official Announcement of Presidential Candidate John McCain's condition will be made just before the election, on November 1, 2008. John McCain's condition will be described as quite serious, an artery blockage of some sort in his neck or in his brain, which has left him unable to preform the duties of President of the United States should he win the election. Another announcement will be made immediately afterwards that an Executive Order is issued to suspend the elections in "Fairness to the Election Process". The United States goes into an uproar. Nothing else will be seen or spoken about on television except for the suspension of the Presidential Election. Many United States citizens will believe that since John McCain was not favored to win, by quite a large margin, that this affliction was somehow caused by, or orchestrated by, the White House solely to suspend the elections and stay in power, as the chance of victory was very remote. American Citizens crowd the streets in Protest in Washington DC, New York City, Los Angeles and begin commit mob acts of great violence. The suspension of the national Presidential election coupled with the subsequent violent protests lead America in a dark direction for the future. What needs to be done now to prevent this? John McCain needs to have this potential problem evaluated and stopped at all costs. The vision was very specific as to the reported cause, but perhaps not the actual cause. My vision, as shown to me by the True Soul of Nostradamus, was from the eyes of the citizens and only have the knowledge that they will have available. Law makers need to consider the possibility now and plan for what steps must be taken should this event still occur. It will be the greatest joy and gift to the world if this prophecy does not come true. It means that this Prophecy was believed and the tragic events stopped. The True Spirit of Nostradamus has shown me this psychic vision of the coming United States Presidential Campaign and Election for 2008. I have seen several thousand future psychic visions as guided by the Soul of Nostradamus, which I am beginning to release to you, my readers and the world. I am being very truthful and sincere and I pray that someone believes me now as this is the beginning of very tragic events for the World's Future. To view my newest psychic postings please click here on Nostradamus Predictions to go to my Homepage. Please click here to read Nostradamus visions as shown to Psychic John Le Sainte of the Upcoming New York City Earthquake, bridge collapse and train derailment. This New York City Earthquake is explained in great detail. Nostradamus Predictions of the Great Paris Fire that Will Destroy Much of the Great City. Nostradamus Predictions of the Mount Rainier Volcano in Seattle, Washington State USA Becoming active and Exploding Destroying several cities including Downtown Seattle. Nostradamus Predictions about the Dangerous and Destructive Nuclear attack by Terrorists as Revealed by the True Living Soul of Nostradamus to Psychic John Le Sainte. It may be Prevented! The TRUE meaning of 666 and the Coming World War 3 three the Information and Technology War as revealed and shown to John Le Sainte by Nostradamus. The mark of the Beast 666 is already upon you.